This is an aggro/combo mono-green deck. Rhonas surprised me with so many interactions and synergies, so I decided to try and build this deck. The deck runs a lot of fast mana spells for explosive start and for making early pressure on your opponents. Also deck runs a wide array of control spells for defense and disruption. And thanks to Rhonas we can destroy creatures very effectively, which is usually not available for the rest mono-green decks. The deck wins with combat damage, and it can win with the use of several infinite combos, for example - any infinite mana combination + Rhonas - you buff all your creatures infinitely and give them all trample and kill all opponents in one swing. Trying to write the Primer for this deck and for now it is WIP so the project is in constant change, this will be my first primer, so I am very inexperienced in this matter and my English is far from perfect. Thus, I will be grateful for any criticism and any help to make this deck and primer much better. Rhonas has a very low mana cost and very impressive stats, which means that he will always stand on the battlefield in the first turns of the game, ready to give you all the advantage he could provide from his high stats. One of the main weaknesses of the green magic was always the lack of creature removal. So as we can see Rhonas combines two abilities - Deathtouch and Indestructible, which makes him a real killer and a master of martial arts. He FIGHTS and DEALS DAMAGE like no-one else, sending his victims right in to the graveyard. Any 1 damage from him will kill almost anything and he will remain on the battlefield due to his Indestructibility. Rhonas is the winning condition by itself. In particular, I am talking about his ability to give +2/+0 and trample to target creature. All you need to win the game with this ability is infinite mana and creatures to smash people’s faces with infinite combat damage and trample. Thus, having an arsenal of specialized spells to destroy creatures with Rhonas and having a basic arsenal of green spells to destroy other permanents, we have a commander that can control absolutely everything that happens on the battlefield, is a winning condition by itself and a very cheap fodder for huge card advantage and additional mana. As for me, it looks like a really good choice for making a good mono-green deck. So let’s start. You are a greedy person, and Your favorite style of playing is to generate a ridiculous amount of mana, and explosively win the game. The deck runs the best mana dorks, rocks and ramp spells and also contains several infinite mana combinations. Thus, it is quite common to have a huge amount of mana at the very beginning of the game and to cast something like Craterhoof Behemoth / Terastodon on t3 or t4. Some of the mentioned dorks grow even faster by other creatures of the deck, for example Rhonas the Indomitable + Selvala, Heart of the Wilds . By itself, green magic provides a pretty good arsenal of spells for drawing extra cards, tutor for creatures and land cards. But with Rhonas it becomes even easier and we can draw 5 extra cards right on turn 3 easily with spells like Life's Legacy , and then on turn 5 drop Protean Hulk with hardcast and sac it with Greater Good bringing madness to the table. Cards like Garruk, Primal Hunter , Momentous Fall and Greater Good are the best friends of Rhonas and can draw a lot of cards for us. As already mentioned, the deck carries a very serious controll package to deal with literally any possible treat. Artifacts, Enchantments, Lands or even Planeswalkers, we can easily deal with them while playing with a green deck. But with Rhonas in the head of the deck it is possible to deal with creatures too. And this makes this deck even more versatile. 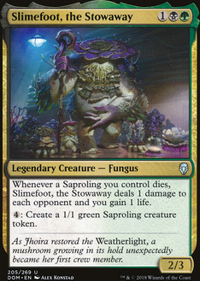 Mainly this is a creature based mono-green deck and we lack of counter spells for protection or answer for wrath spells, so board wipe spells are a real danger, especially mass exile and Toxic Deluge , because those will hit Rhonas too. Super-fast combo decks can outrace us. But, nevertheless, all the above-mentioned is quite manageable for this deck. But especially painful will be the resolution of the effect like Humility . With all the speed and creature tutors that is contained in the deck, and the commander who has such high stats, low cost and the ability to buff creatures and give them trample, the deck can win the game with ordinary combat damage very quickly, spells like Avenger of Zendikar , Craterhoof Behemoth , Vorinclex, Voice of Hunger , Ulamog, the Infinite Gyre , Tooth and Nail , Bane of Progress and Terastodon are the key cards in this strategy. The most important thing here is to continue to press on the enemy with our big creatures, forcing opponents to constantly seek protection and answers. In parallel, we shoot of any permanents that interfere with the achievement of the goal and disrupt any opponents plans with wide array of control spells. The infinite mana created by infinite combos is usually used for Rhonas's ability to pump any creatures with infinite +2/+0 and trample and kill all opponents. For plan B (Rhonas was stolen for example) we have Cloudstone Curio , with infinite mana we just recast infinitely any creature and destroy/exile/draw/tutor etc. until our opponents will be dead or give up. Selvala, Heart of the Wilds + Umbral Mantle + creature with 5 power or greater - infinite . This is one of the most powerful and fastest combos. Because Rhonas makes this combo possible. And until you will fetch Mantle, Rhonas and Selvala will speed up your deck insanely with additional mana and cards. Argothian Elder + Maze of Ith - infinite mana on combat phase. This combination, creates infinite mana by untapping attacking Argothian Elder with Maze of Ith on our combat step and then using untapped Argothian Elder to untap Maze of Ith and another land. Repeat the process infinitely. In normal situations, this combination is useless, since all the created mana disappears after the end of combat phase, and it is very hard to use it to win instantly during combat phase. 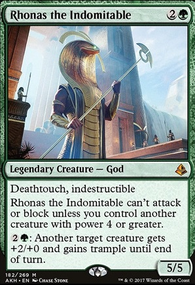 But rejoice, because we have Rhonas on our side, so we need to use his pump ability on instant speed to make all our attacking creatures infinitely large with trample right before the combat damage step and kill all opponents. An alternative of use all the mana could be spells like Chord of Calling . An additional bonus of this combination is that we come in to our second main phase with untapped lands. So additionally it works like Sword of Feast and Famine . Cloudstone Curio + Concordant Crossroads or Thousand-Year Elixir + mana dork that gives enough mana after you recast it ( Priest of Titania , Argothian Elder , Selvala, Heart of the Wilds , Karametra's Acolyte , Elvish Archdruid ) - infinite . Cloudstone Curio + Earthcraft + two creatures with mana cost + Wild Growth / Utopia Sprawl or mana doublers - infinite . Ancient Tomb , City of Traitors , - These lands provide us with extra speed. Rhonas ETB on turn two with these lands in an opened hand. Cavern of Souls - another one great unticouterspell land, usually I choose "elf" creature type, due to the fact that this deck runs a lot of elves, and the key combo pieces in this deck are elves too. Dryad Arbor - brings value in this deck in so many ways: ramp for with Green Sun's Zenith , counts as an additional creature for Gaea's Cradle , Craterhoof Behemoth , Regal Force , 0 cmc creature drop from Protean Hulk , discard for Survival of the Fittest and Fauna Shaman , great sac fodder for Natural Order . With Craterhoof Behemoth Dryad Arbor becomes a huge additional beater. Gaea's Cradle - one of the best and the most important card of the deck (cornerstone of some combos). The amount of mana it can produce is insane. Nykthos, Shrine to Nyx - another one crucial land, serves for the same purposes as Gaea's Cradle . Wooded Foothills , Windswept Heath , Verdant Catacombs , Misty Rainforest - those are great for thinning the deck, and even more important for shuffling the topdeck. Very useful with cards like Oracle of Mul Daya , Mirri's Guile , Sylvan Library . Rishadan Port - very often this deck has an excessive mana, so why not to use it to shut our opponent’s specific lands? Rishadan Port can become a reusable version of Strip Mine . Fyndhorn Elves , Joraga Treespeaker , Elvish Mystic , Llanowar Elves - one drop mana dorks. Fast, reliable mana producers, synergizes with Priest of Titania . Avenger of Zendikar - fantastic creature, it has huge amount of synergies in the deck. He can be a finisher in aggro strategy of the deck and the best way to end the game with him is to cast Tooth and Nail and to drop him with Craterhoof Behemoth . He can provide insane acceleration with Gaea's Cradle and ridiculous amount of extra card draw with Regal Force . Caustic Caterpillar - very fast spot removal. But the most valuable feature is that it can destroy targets on instant speed. Oracle of Mul Daya - this fantastic creature gives us an extra lands every turn, which means that we can start the game with a lot of lands and explosively win, or drop a lot of lands in late game by drawing a lot of cards. 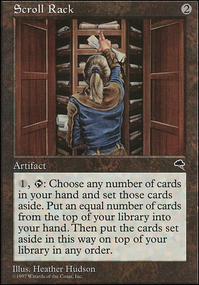 Additionally, Oracle provide an interesting form of card advantage and top deck control. Bane of Progress - this one is a good enchantments/artifacts mass removal, and after he gets bigger by eating those permanents he can "turn on" Rhonas for blocking and attacking, or can be used by all the spells which are intended for Rhonas (card draw-, mana- depending on power, or creature removals). Craterhoof Behemoth - famous green monster, who usually is used for ending the game with combat damage with a one brutal swing. He actually synergizes with other cards: Selvala, Heart of the Wilds / Devoted Druid - Huge amount of mana will be produced. Greater Good / Life's Legacy / Garruk, Primal Hunter / Momentous Fall - insane card draw. Elvish Archdruid - another Priest of Titania in the deck, another elf, another combo piece for infinite mana, another high-intensity devotion creature. SWEET! Eternal Witness - staple in any green deck. 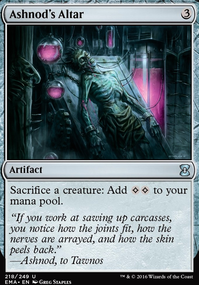 Along with the fact that this card is good in itself as recursion spell, it can provide infinite casts from graveyard with infinite mana with Cloudstone Curio and can bring back initial spells in the hand after resolution for recast ( Protean Hulk , Tooth and Nail , Chord of Calling , Genesis Wave , Green Sun's Zenith etc...) if it is necessary. Fauna Shaman - repeatable creature tutor. Can be used twice a turn with Quirion Ranger , Wirewood Symbiote , Wirewood Lodge . It is just so awesome. Priest of Titania - very powerful mana producer, can be used for making infinite mana with Umbral Mantle and three other elves. For this goal the deck runs a lot of elves. One of the best ways to assemble it is to crack Protean Hulk , and when it goes to the GY you put Priest of Titania and up to 4 other 1 cmc elves on the battlefield. Protean Hulk - this one is broken as hell. Pretty often I see that green decks avoid to use Hulk, because they often lack of sac outlets to kill him. But this deck runs a lot of ways to do that. Sac him with Greater Good , Life's Legacy , Natural Order or Momentous Fall . Kill him with Beast Within or with Rhonas using spells like: Ulvenwald Tracker , Viridian Longbow . He brings a real disaster on the battlefield. My favorite is to sac him with Greater Good right before my turn. Quirion Ranger - with all the dorks and land untappers this guy can make insane amount of mana. Favorite targets are - Arbor Elf , Argothian Elder , Devoted Druid , Priest of Titania , Selvala, Heart of the Wilds , and Karametra's Acolyte , Another way of use it is to bounce Dryad Arbor for blocking enemy creatures. Regal Force - this one is one of my favorite green creatures, it can create insane synergies for drawing tons of cards, and it "turns on" Rhonas. Insanely good with Avenger of Zendikar . Selvala, Heart of the Wilds - this card by itself is a monster, it gives a lot of mana and card draw, but often people avoid to use her, because she can give extra cards to opponents. But it won’t happen in Rhonas deck. From the start of the game you will always be the person with the most powerful creatures, because Rhonas ETB on turn 2 almost always. In this deck Selvala is a shining diamond, cuz if you put her on the battlefield on turn 3 without haste, you will have all the chances to end the game on turn 4-5. Selvala, Heart of the Wilds + Umbral Mantle - creates an infinite mana combo with any creature with power 5 or more, and Rhonas has exactly 5 power and the ability to kill everyone with infinite mana. Terastodon - Super powerful creature in this deck because his stats bring benefit from power dependent spells in this deck and his ability to destroy 3 noncreature permanents is insane! One of the best targets to cheat in the battlefield for Natural Order , usually if we drop it on turn 3-4 - it is a GG, very often people just concede seeing this happened. Ulamog, the Infinite Gyre - Super powerful finisher with indestructible and uncounterable spot removal in one body. It can circumvent some really powerful stax cards like Contamination , Infernal Darkness , Humility , Iona, Shield of Emeria and others. Its annihilator ability is a death sentence when he attacks. One of the best ways to cheat him directly in to the battlefield is Pattern of Rebirth or epic cast with Genesis Wave . It has a very strong synergy with Survival of the Fittest , Fauna Shaman (graveyard recursion) and with Greater Good . Ulvenwald Tracker - one of the secret tech of Rhonas creature killing. When this guy and Rhonas are on the battlefield we able to kill one creature per round on instant speed. Wirewood Symbiote - any untapper is a beast in this deck. And if this untapper can help to save our elves bouncing them into our hand, it is even better. Concordant Crossroads - this an aggro deck, so "haste" is a very important ability here, whether we drop Avenger of Zendikar and Craterhoof Behemoth with Tooth and Nail , or Ulamog, the Infinite Gyre with Pattern of Rebirth . Additionally it allows us to use mana dorks in the same turn they was cast, so they literally become free, and it makes possible to go infinite with Cloudstone Curio . Greater Good - just fantastic card in this deck, with the capability of Rhonas to ETB on turn 2 easily this card will never miss its fodder and will always provide us with a huge amount of cards and capability to dig very deep into our library. Cards that has a very strong synergy with Greater Good : Craterhoof Behemoth - after he buffed all creatures and they attacked, it is very juicy to sac those enormous dorks/utility creatures to dig in 7-10 cards in our deck; Regal Force - drop it on the battlefield, draw a lot of extra cards and then sac it with Greater Good for even more cards and to dig really deep; Protean Hulk - if you sac this guy with Greater Good right before your turn, than you probably already winning the game, Terastodon , Ulamog, the Infinite Gyre , Vorinclex, Voice of Hunger all are perfect targets for Greater Good too. Mana Reflection - famous green doubler, nothing to say here, if it stays on the battlefield till our next turn, then we probably win the game. Another powerful combo with it is Mana Reflection + Grim Monolith / Basalt Monolith - it creates infinite , right now I am thinking to include Grim Monolith in the deck, but it is hard to find a card slot for it. Song of the Dryads - one of the best spot removals ever. It can deal with practically anything. And it can shut down many pesky permanents. Especialy good to turn in to a pumpkin powerful commanders. Pattern of Rebirth - the deck runs a lot of ways to sacrifice and kill creatures for gaining advantage, so this card will always drop something like Vorinclex, Voice of Hunger / Terastodon / Ulamog, the Infinite Gyre (early in the game) or Craterhoof Behemoth / Avenger of Zendikar to close the game. Protean Hulk enchanted with Pattern of Rebirth and then sacrificed with Greater Good is an epic spectacle and a GG. Survival of the Fittest - one of the best creature tutors in Magic. Reusable, fast, easily playable in this deck because of great amount of creatures. Sylvan Library - undoubtedly the best card advantage spell in green, staple in any green deck. Cloudstone Curio - fantastic artifact, has a lot of different synergies and combinations in the deck, it can create infinite dork cast with Concordant Crossroads / Thousand-Year Elixir , it has powerful synergy with City of Traitors (we bounce City in to our hand instead of sacrificing it) and it is just a very powerful spell to reuse all those ETB creatures. Umbral Mantle - combo piece for infinite mana combo, how it works is described in "Infinite combos:" section. Viridian Longbow - decent repeatable spot removal for creatures, which intended to use with Rhonas. Winter Orb - Considering a large number of nonland sources of mana (dorks, land enchantments etc. ), this card is always asymmetrical when it is online, it hits much harder my opponents than me and slows down fast decks. Green Sun's Zenith - this card can bring almost anything from the library to the table for extra , it is a great tool for ramp (drop mana dork or Dryad Arbor on turn one for ), for ETB creatures (control, finishers, card advantage) and combo pieces. Amazing spell! Genesis Wave - I just love this card; it can end the game with enough mana easily. And it fits here perfectly, because this deck consists almost only of permanents and can generate huge amount of mana. 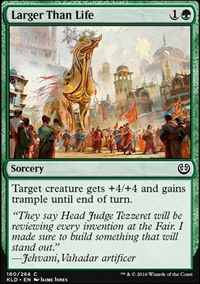 Natural Order - one of the most potent cards in green magic, the unfairness of this card is even larger if we have creatures with "when it dies" abilities, for example Protean Hulk . Beast Within - this is just a very good removal, can destroy almost anything on instant speed, what not to love? Momentous Fall - great card, again, especialy good with Rhonas, because he ETB on turn 2 and has 5/5 body. Due to the fact that it is instant, it is very useful to use it in response to someones wrath spell. Worldly Tutor - fast and reliable creature tutor, staple in many decks. Garruk, Primal Hunter - basically, this card is for blasting card advantage (at least 5 cards with Rhonas), token generation for Gaea's Cradle and other creature dependent spells, and Garruk brings a lot of additional devotion for Nykthos, Shrine to Nyx and Karametra's Acolyte . Regal Force - I wana try something else for card advantage instead of RG (many times it was to slow), e.g. Weatherlight ,it is easily activated by Rhonas and can dig very deep for cards like Garruk, Primal Hunter , Gaea's Cradle , Nykthos, Shrine to Nyx , Selvala, Heart of the Wilds , Ulamog, the Infinite Gyre , Vorinclex, Voice of Hunger and all artifacts. Sylvan Tutor is out, and Finale of Devastation is in! Finale of Devastation - it is totally crazy card!!! Avenger of Zendikar , Craterhoof Behemoth and Terastodon (targetting your own lands) with X = 10 is a GG. and the fact that it can fetch creatures even from your GY is so good.